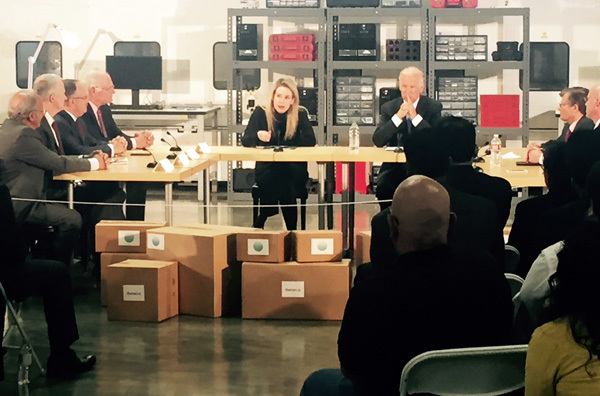 Theranos CEO Elizabeth Holmes and Vice President Joe Biden spoke on the importance of preventive medicine at a press event in Newark, CA. Image courtesy of Theranos. The Silicon Valley-based blood testing company aims to market its tests, which only require a fingerprick's worth of blood, directly to consumers as well as influential insurance organizations, doctors, the government, and pharmacies. Joe Biden provided a personal endorsement for the futuristic blood testing firm Theranos (Palo Alto, CA) in a visit to the firm's manufacturing facilities Thursday. Biden, whose eldest son Beau recently died from brain cancer, said that his family had "been a big consumer of healthcare" and that the healthcare system must change to become more empowering for patients. 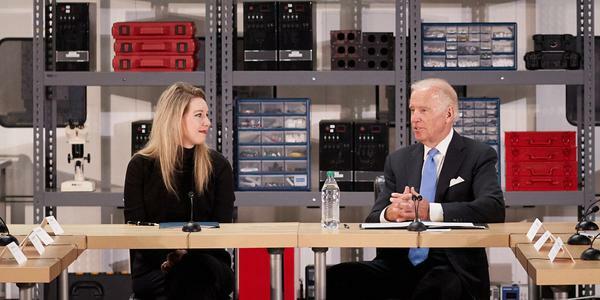 Theranos, whose blood tests cost a fraction of traditional tests, represents the future, Biden said. "You are empowering people whether they live in a barrio or a mansion and allowing them to take control of their healthcare. The president and I share your vision that healthcare in the future will be based on preventive care." "Talk about being insipired! This is inspiration, man," Biden quipped. "This is the laboratory of the future," he said, contrasting it with traditional lab testing, which he described as "expensive, inconvenient, and disruptive to work schedules." "They are painful and bring discomfort," the Vice President added. "And a lot of people have phobias of needles." Theranos, whose name is an amalgamation of "therapy" and "diagnosis," says that it can offer every lab test at a fraction of the cost of traditional tests. Its thyroid stimulating hormone lab test, for instance, costs $12; conventional labs can charge as much as $57 for the same test. "We want to prove that it is possible to realize a reduction of healthcare costs while keeping the manufacturing in the U.S., and that in being able to make a dramatic reduction in costs we can begin to make health information accessible at a time it matters most," said Elizabeth Holmes, the company's CEO who founded the company at the age of 19. Theranos CEO and Joe Biden are flanked by medical executives hailing from institutions across the country. Image by Qmed. "If we can change our system to make early detection and prevention realities, we will not only change outcomes but also change the cost of care. We believe so strongly that every person has the basic right to access information about their own health," Holmes added. Holmes coauthored a recently passed Arizona law that enables patients to obtain blood tests without a doctor's note. Theranos offers hundreds of tests, ranging from ABO/RhD blood typing to hepatitis antibody tests to white blood cell counts--many of them costing less than $10. The press event was followed by a roundtable discussion featuring Biden and Holmes along with the following medical executives (some of whom are shown in the picture above): Robert Harrington, MD, chair of the Stanford University department of medicine; Mark Laret, CEO of the UCSF Medical Center; Michael Roizen, MD, chief wellness officer at the Cleveland Clinic; Amir Rubin, CEO at Stanford Hospital & Clinics; Gary St. Hilaire, president & CEO of Capital BlueCross; Bert Lubin, MD, CEO and president of Children's Research Center of Oakland, and Darin Gordon, director of TennCare. 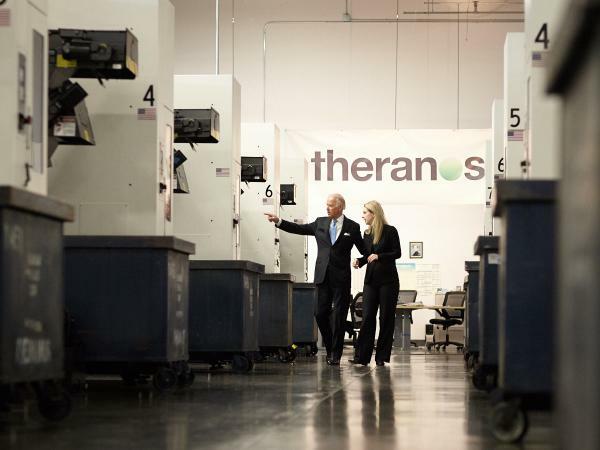 While visiting Silicon Valley, Biden got a personal tour of the Theranos facility in Newark, CA. Image courtesy of Theranos.